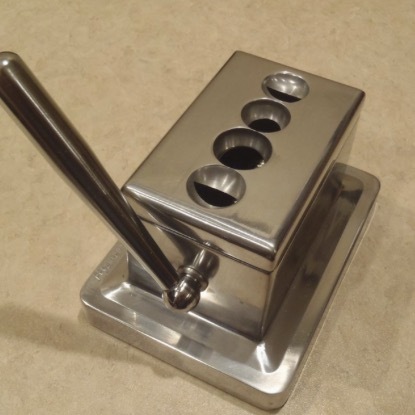 This all Stainless Steel cast body Table Cutter has two straight cutters for 52 and 60 ring cigars along with two V-Cutters for 52 and 58 ring cigars. This item is truly a hand~made masterpiece preferred by Cigar Aficionados around the world! The unique notch cut prevents the tongue from contacting bitter deposits that settle in the crux of the notch. Super sharp stainless steel razor blade will hold its edge for hundreds of cuts. The blade is spring loaded and hand milled from solid surgical steel. The cuttings are collected internally and bottom removable door makes it easy for emptying and cleaning the unit. All orders are shipped within 3 business days and Our company provides a 10-Day Money Back Guarantee on all purchases. Buyer pays fees for RETURN shipping. All of our items will be shipped USPS Priority Mail. I was looking for a cigar lounge in the area where I could sit back and enjoy a nice cigar without suffering the cold of the winter. What I found was a home away from home. I have been to many other cigar lounges over the years and VCH is second to none. As soon as you walk in, you are made to feel comfortable both by the open layout and the welcoming people. The cigar quality and selection is outstanding, the ventilation is excellent and the staff is extremely knowledgeable. I really enjoy trying new cigars recommended by Miguel, Eddie and AJ. I would highly recommend Village Cigar Headquarters to anyone looking to simply pick up a stick or come and hang out with a great bunch of people. - Christopher W.
Unlike the dingy smoke filled cigars parlors of the past, VCH is an ultra modern lounge. It’s clean and vibrant. The thing I love about this place is the vibe. It’s not the regular group of people talking about how it used to be… It brings people that talk about how it is. Not only can you find legendary blends like Romeo, Montes or Fuentes but the boutique lines like Viaje or Pura Soul are exceptional. VCH’s signature line the Exclusivo may be the best of the bunch in here.